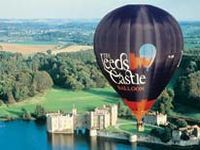 The grounds of Leeds Castle - "the loveliest castle in the world" - unquestionably offers one of the best hot air balloon launch sites in Kent. The site is backed up by superb alternative balloon ride launch venues should the need arise. The lush green Weald of Kent provides a simply breathtaking spectacle when seen from the air. Few can resist the attraction as one hundred feet of wispy nylon majestically rises with the roar of the burners. The feeling of peace and tranquillity is heightened by the apparent lack of wind - because you're moving with it. Once in the air, your balloon travels up to heights of several thousand feet, allowing you to gaze down upon villages, towns and the countryside. We round off every balloon flight with a champagne celebration and a commemorative flight certificate presentation, making the occasion even more memorable and ensuring that the experience is one that will stay with you for years to come. Flying over an area of the country you know well is a great experience. Once purchased a flight voucher along with the passenger information leaflet will be sent. This includes check-in times, and lots of practical information about the flight to help you enjoy your ballooning experience to the full. Minimum age 8 years and 1.4 metres in height. Passengers should not fly if pregnant. Meeting locations/launchsites may be subject to change for operational reasons, eg) wind direction. Paddock wood, Kent, TN12 6PY. The voucher will have Paddock Wood printed on it, but it can be used from..